What the Hell Happened to My Ankle? It’s huge! My right ankle is swollen. Why? This morning, it was normal. I put on my shoes and went to work. At work, as the morning progressed, I felt a stiffness in my ankle. When I put my shoes on to get my lunch, I noticed the edge of my shoe was pushing into my ankle. I have new shoes, so I thought it was just the shape, and that it needs to be broken in. 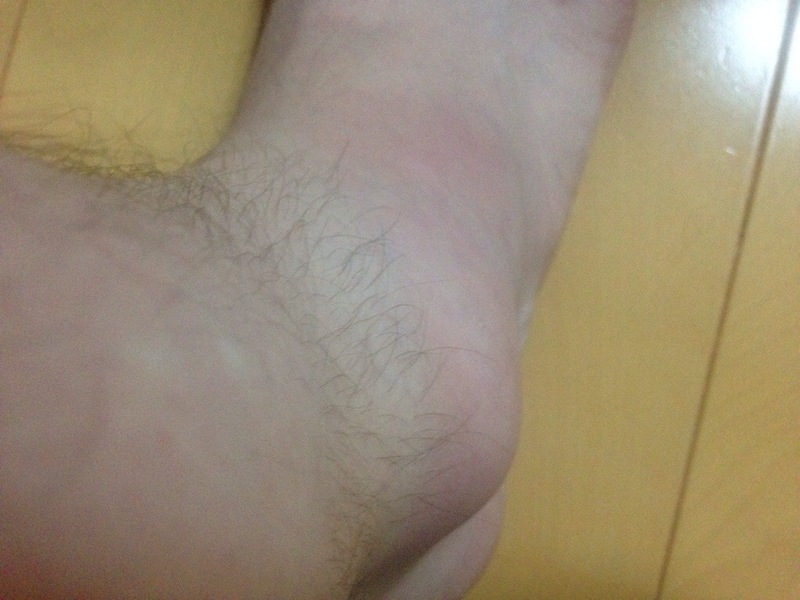 In the afternoon, I noticed that my ankle was much bigger than normal. 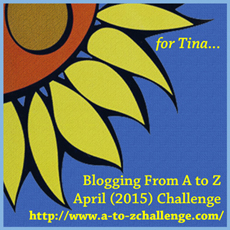 It was tender, and there was (and still is) pain when I put pressure right on the ankle bone. So, how did it happen? The past two weeks have involved a lot of walking, and it’s very possible that I tweaked it after our Mt. Oyama climb. In fact, the original injury could have happened while we were going down the mountain, since I remember twisting that ankle slightly. With more walking over the rest of the week, I probably aggravated it, and then with the new shoes putting pressure on my ankle, made it even worse. At least that’s my guess. I’ve been on my feet a lot, too. I’ll have to see how it goes over the next couple days. I’ll try stay off my feet as much as I can. Today’s our first real big sightseeing day, and what happens? I wake up with a barely there voice. I find it hard to talk, and I have a sore throat. I won’t let that stop me, though. Today is Enoshima. It’s a big day, because we tried going to Enoshima three times last year, and something always came up to stop us. But we will go today, explore the island, then see the aquarium. I’ll be making a couple videos, but I may not be talking much on them. 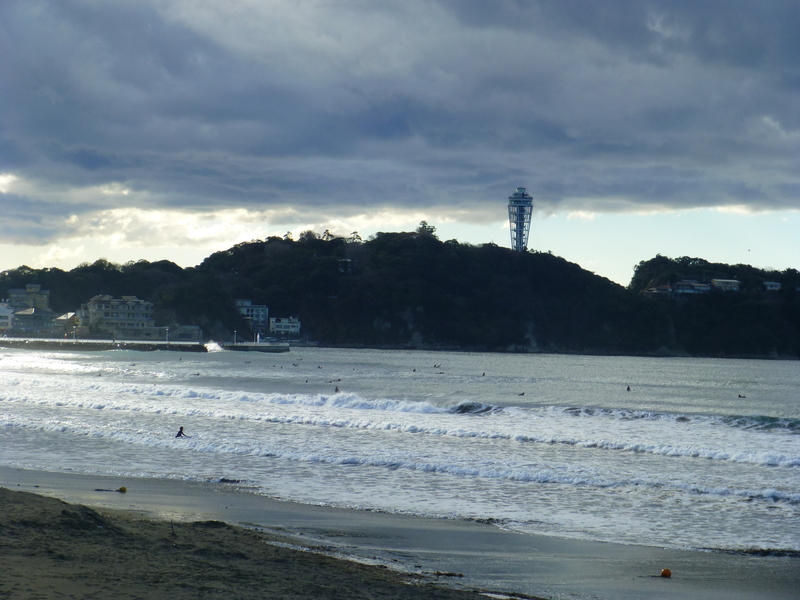 Here’s an Enoshima picture just to show you what it looks like. Not what expected on a Sunday morning going to work. I was about to enter the station when I saw paramedics wheeling a man on a stretcher through the ticket gates. He seemed a bit overweight, and his shirt had been removed. Heart problems? Heart attack? That’s what I’m guessing. It’s really not what I want to see at any time. I have doctor’s orders not to eat. It’s not because I’m sick or anything. I have my annual health checkup tomorrow morning. In Japan, we’re often required to get a medical checkup every year for our job. It’s a pretty easy process. Basically, I can’t eat anything after 9 pm the night before the checkup. I can only drink water. At the checkup, I first have to pee in a cup for a urine test. That’ll check for things like blood sugar level. Then they take a chest x-ray. After that, there’s height, weight, and measuring the waist. Then it’s on to blood pressure, hearing test, and checking eyesight. Finally, it’s a very brief talk with the doctor about any existing conditions, and listening to the heart and lungs. If I was 35 or 40 and over, I’d also have to have an ECG and blood test. If all goes well, I’ll be done quickly, but I can’t guarantee that. I’ll be glad when it’s done. I live in the world’s largest metropolitan area, the Greater Tokyo area with a population of around 36 million people. I’m near the southwestern part of it, but nearly everything around me city. There are farms not far from here, but they’re crisscrossed by roads, houses here and there, and never far from a convenience store. Last week, I went hiking in Kamakura. Occasionally, I saw houses and buildings from high up on the hiking trail, but I felt more secluded than I’d felt in a very long time. I know a part of the trail (that we didn’t go on) that is completely closed off from the rest of the city. No sounds, no sign of civilisation. It’s in a forested valley with a small stream and absolutely peaceful. Kind of like this viral video. Nice, huh? I want to go to the real countryside and go walking in a real forest that’s actually not surrounded by a great metropolis. And there, I want to walk around, look at the trees, listen to the sounds of the birds, and have a nice relaxing time. That’s where I want to be right now. Energy, Why Have You Left Me? Yesterday was the worst day for allergies so far this year. Today looks pretty bad, too. As a result, the medicine didn’t work at all. I have been completely sapped of energy, too. It’s possible I may have a cold at the same time. I can’t tell, they’re so similar. Today’s going to be fun. I’d intended on doing some writing today, but just didn’t have the energy. I’m also behind on replying to comments. I’ll get caught up, don’t worry. My fingers just don’t want to move very much at the moment. Well, must get ready for work.